Large scale scroll design outlining a sophisticated tailored collection of shams, coverlets and duvet covers all constructed on Pique and long staple 275TC Egyptian Cotton sheeting. 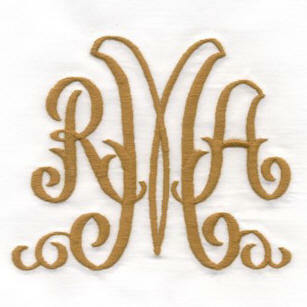 Shown is the flat sheet with the optional embroidered return along the side hem. This collection is very customizable and may also be embroidered on matching towels and shower curtains. 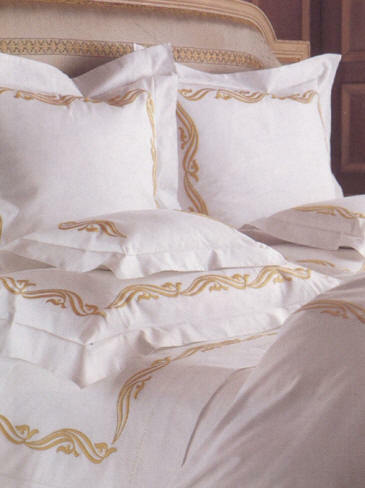 Coverlet and Duvet Embroidery from head to foot. Pique and Sheeting available in white or ivory. Machine wash and dry gentle. Remove promptly.